We reviewed the online translation service DeepL when it first appeared online in 2017 and concluded back then that it did offer high-quality translations that often beat those of comparable services such as Google Translate or Bing Translate. Users had to paste or type text on the DeepL site to use the service to translate it to one of the supported languages. Language support was somewhat limited back then and that is unfortunately still the case with just seven languages supported at the time of writing. 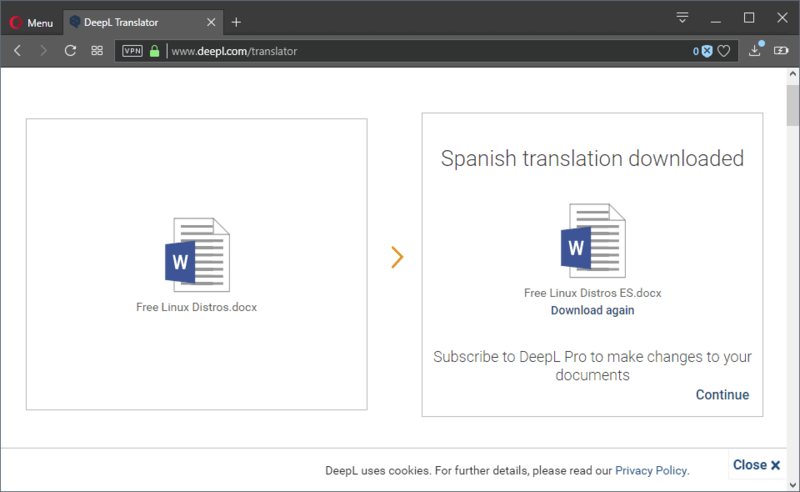 DeepL supports English, German, French, Spanish, Italian, Dutch, and Polish translations currently; this leaves out widely spoken languages such as Portuguese, Russian, Chinese, and limits DeepL's reach because Google's and Microsoft's offerings support pretty much any language out there. 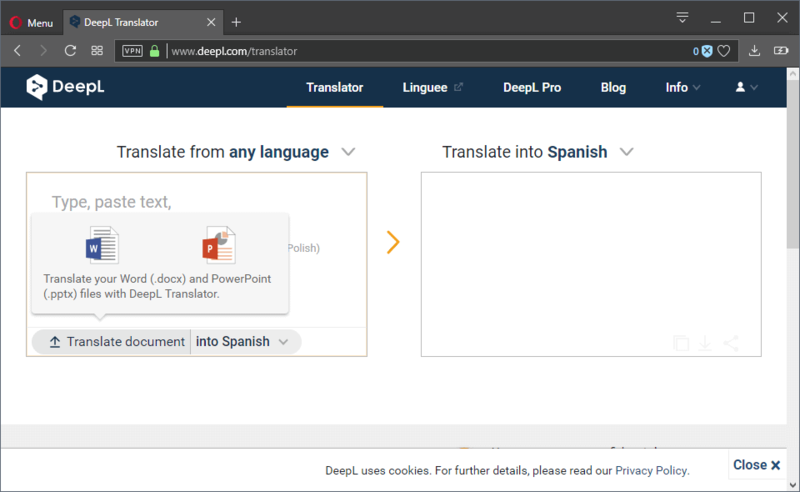 The company behind DeepL rolled out a new feature recently that gives users options to use the service to translate documents they upload to it automatically. Usage is pretty straightforward as the new functionality has been baked into the interface. A click on the translate document on the Translator page on the DeepL website displays supported formats and lists the languages that the document may be translated to. DeepL's support for formats is limited to the Office formats .docx and pptx right now; it does not support doc or ppt, or other formats such as plain text txt or open formats. The document is uploaded to the service once you have made the selection. It is then translated on the fly and downloaded automatically to the local system again. You can click on the "download again" button to restart the download if something blocked it. DeepL won't touch the formatting of the document in any way. The company states that the service translates all elements of the document including body text but also titles, captions, or footnotes, and that the original formatting is retained. It is possible to edit the document locally after translation and download; DeepL Pro customers benefit from faster translation speeds and options to edit the translated file. I was able to edit the downloaded file in Word, however without Pro account. DeepL promises that it will add support for additional formats in the coming months; the company did not reveal the formats in the announcement, however. Support for document translations is an important feature that should increase the reach of DeepL. I threw a couple of documents at DeepL to find out how well the translation of documents worked. While translations are understandable, they are far from perfect. I just checked the English to German translation capabilities; any document that I uploaded to DeepL needed work after the translation as sentences sounded robotic and not human-like for the most part. Now You: Which translation service do you use, and why? I have been using DeepL ever since you brought it to our attention and have been happy with the quality of translations. I use Google Translate as a kind of back-up, when I need more possibilities of a translation, which I miss in DeepL. GT gives more phrases and sometimes more synonyms too. I look at DeepL as a start-up that needs time to mature. I use the Deepl translator for some wile and I am quite pleased with it and yes I would like some more languages added but I really like the new possibility to at once translate a complete document. I agree with Martin that after the translation sentences are sounding robotic and not human-like for the most part. But with the translation from Englisch to Dutch I understood pretty well more than the essence of the article so that I could knit the article straight with little effort (do they say that in Englisch?)! Hopefully, Deepl is going on with keeping their development team pointing in the direction of developing handy things like making it possible to translate a complete document and once and making translation less robotic. Tried only this French word “consternant” with language detection to translate it into English. DeepL document translations > totally useless to me as I do not use Microsoft Office formats. “Consternant” while taxpaying citizens since years are trying to persuade governments to use open source software to see developers continuing to “lick the arse” of Microsoft. A “good” robot translator needs lot of people giving their time and knowledge to make it “working”. Either you are rich enough to pay them, either you need help from volunteers interested in the project. In that case at first choosing a proprietary format to me is nonsense. Well apparently Polish is more popular than Russian, Chinese, and Portuguese. The legendary Polish Empire and all their Polish-speaking colonies I guess? What is called Machine Translation is the hoax of the century. It is nothing more than a language conversion algorithm, and language conversion is not the same as translation, reusing large, huge, datasets of previously translated content in varying degree of quality (the majority is completely rubbish as most translations produced in the world are of very poir quslitu, to good). It’s a mathematical exercis in approximation. Now we are also experiencing machine translated (most often poor in quality) being fed into the algorithn as training dataset. Ih, and guess what, your data (content) is being collected, re-used, and effectively re-sold (it was used to train the engine and theoretically improve it, only so the companies could sell your effort driven service to others without paying you anything). I hope you don’t use it for anything confidential, and uploading content that is protected by copyright when you don’t have the rights to it (i.e. translating an article someone else wrote and that is protected by copyrights), could result in liability for copyright infringement. And this is even without touching in the subject of the cognative damages resulting from prolonged and repeated exposure to poor langauge. There are several scientific articles on the subject.